There are two new electronic books (PDFs) with ready to use Autograph files by Dr James Kett "Dynamic Algebra with Autograph' and 'Dynamic Statistics with Autograph' (see below) and two physical books with CD-ROMs by Craig Barton. 'Autograph Activities' books by C N Barton. The Teacher Demonstrations Book and Student Investigations book complement each other perfectly. See below for details, ordering information and bundle discounts. Both books come with a CD with support materials for each chapter and a 30-day trial of Autograph. 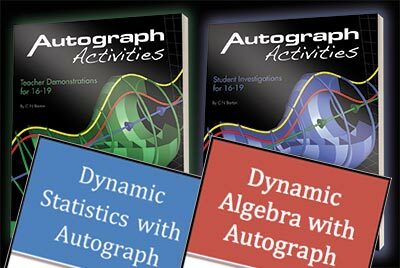 Autograph Activities: Students Investigations for 16-19 Autograph is an excellent tool for investigation, and mathematics is at its strongest and most appealing when students can embark upon such journeys of self-discovery. The ten activities are designed to allow students to fully utilise Autograph's power to explore, investigate and ultimately understand concepts at a depth which the normal classroom setting would not allow. Areas covered include vectors, differentiation, integration and trigonometry. Students are equipped with the tools to learn and then encouraged to set off alone on their epic quest for answers. Both books come with a CD with support material for each chapter and a 30-day trial of Autograph. £25, by C N Barton, 2009 There's also a discount bundle of 5 of each book for �160. Bundle of 5 Sets of both volumes of Autograph Activities. 5 x Teacher Demonstrations Books and 5 x Student Investigations books. All full colour throughout and including CD-ROMs of activities and investigations. Both volumes of Autograph Activities. 1 x Teacher Demonstrations Books and 1 x Student Investigations books. All full colour throughout and including CD-ROMs of activities and investigations. This electronic book (PDF) demonstrates ways that Autograph, dynamic graphing software, is effectively utilized as a tool for interactive teacher demonstrations and independent student investigations. Electronic PDF book with free Autograph files for personal use (School Licence available separately). Contents: Introduction; Unique to Autograph; Choose Your Preferences; Shortcuts and Useful Hints. Chapter 1: Linear Equations. Chapter 2: Quadratic Functions. Chapter 3: Polynomial Functions. Chapter 4: Polynomial Inequalities and Linear Programming. Chapter 5: Rational Functions. Chapter 6: Analytic Geometry � Conic Section. Chapter 7: Trigonometry. Suggested Answers to Student Investigations. This electronic book (PDF) demonstrates ways that Autograph, dynamic graphing software, is effectively utilized as a tool for interactive teacher demonstrations and independent student investigations in Statistics. Electronic PDF book with free Autograph files for personal use (School Licence available separately). Contents: Introduction; Unique to Autograph; Choose Your Preferences; Shortcuts and Useful Hints. Chapter 1: Quantitative Data. Chapter 2: Linear Regression. Chapter 3: Sampling. Chapter 4: Randomness and Random Variables. Chapter 5: Probability Distributions. Chapter 6: Sampling Distributions. Chapter 7: Inference. Suggested Answers to Student Investigations. This electronic book (PDF) demonstrates ways that Autograph, dynamic graphing software, is effectively utilized as a tool for interactive teacher demonstrations and independent student investigations in Statistics. Electronic PDF book with free Autograph files. This School Licence allows you to distribute the book and files in accordance to the extent and limitations of your existing Autograph School Licence (whether 50, Site or Extended Site). Contents: Introduction; Unique to Autograph; Choose Your Preferences; Shortcuts and Useful Hints. Chapter 1: Quantitative Data. Chapter 2: Linear Regression. Chapter 3: Sampling. Chapter 4: Randomness and Random Variables. Chapter 5: Probability Distributions. Chapter 6: Sampling Distributions. Chapter 7: Inference. Suggested Answers to Student Investigations. This electronic book (PDF) demonstrates ways that Autograph, dynamic graphing software, is effectively utilized as a tool for interactive teacher demonstrations and independent student investigations. Electronic PDF book with free Autograph files. This School Licence allows you to distribute the book and files in accordance to the extent and limitations of your existing Autograph School Licence (whether 50, Site or Extended Site). Contents: Introduction; Unique to Autograph; Choose Your Preferences; Shortcuts and Useful Hints. Chapter 1: Linear Equations. Chapter 2: Quadratic Functions. Chapter 3: Polynomial Functions. Chapter 4: Polynomial Inequalities and Linear Programming. Chapter 5: Rational Functions. Chapter 6: Analytic Geometry - Conic Section. Chapter 7: Trigonometry. Suggested Answers to Student Investigations.